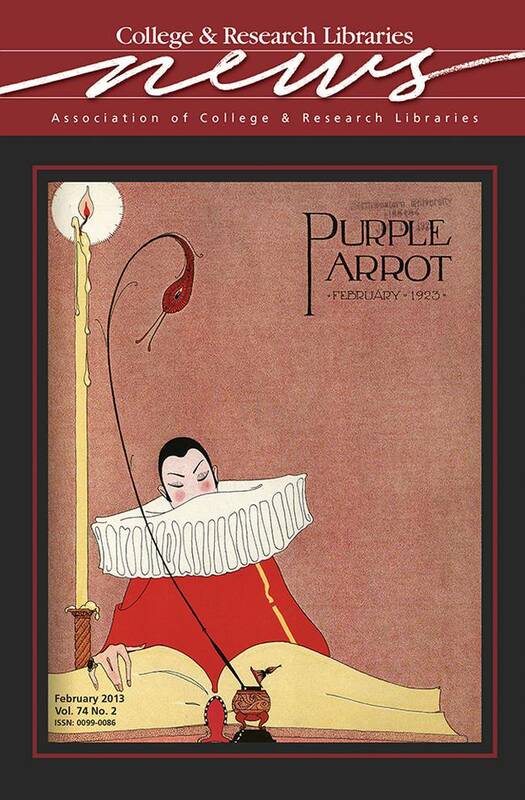 This month’s issue features the cover image of the February 1923 issue of the Purple Parrot humor magazine published by students at Northwestern University (NU) from 1921 to 1950. The Purple Parrot contains short stories, poetry, essays, jokes, and a variety of advertisements. The Parrot parodied all aspects of life at NU: Greek life, notable faculty members, college romance, and even the Daily Northwestern, NU’s student newspaper. Learn more about the digitization of the magazine in Benn Joseph’s article “Fledging the Purple Parrot” on page 66 of this month’s issue. More information on the Purple Parrot, including links to full archives, is available online at http://libguides.northwestern.edu/purpleparrot.